Happy Wednesday, cuties! I probably sound like a broken record but I can't even believer we're in our final week of October. It's just now starting to feel more "fall-like" in Florida, and by more "fall-like" I mean t-shirt/button down shirt kinda weather. It's the perfect sort of weather. I think I may have found my own little paradise. Anyways, if you follow me then you know there are two things I simply cannot resist: a good arm party and a solid graphic tee. I've styled them so many times! So you can check them out here, here, here, and here. But I like this look way more than the others because I stepped outside the box! Something I've been really aiming to do. Instead of wearing my tee unrolled, I went for a knotted bottom and rolled sleeves. Adds a little bit of edge, don't ya think? 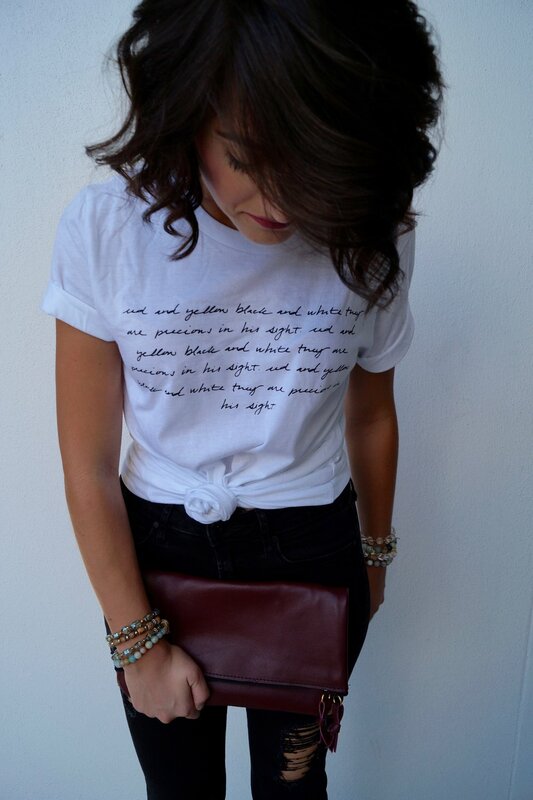 How do you style a graphic tee? Cool & casual? Accessory overload? I'd love to know below!